Freddy Lovato, second from right, and his coworkers in October 2017. 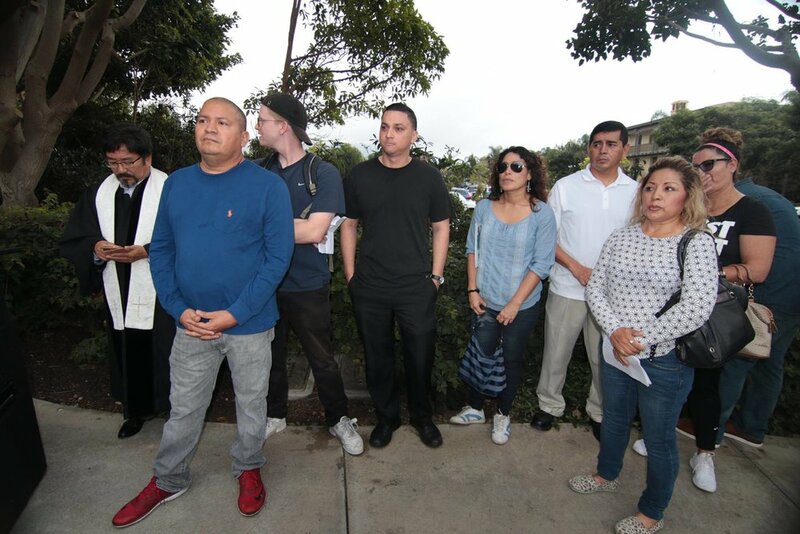 On December 28, 2018, a regional office of the National Labor Relations Board--an independent agency of the federal government charged with enforcing federal labor law--filed a legal complaint against the operator of the Terranea Resort alleging that it fired worker leader Freddy Lovato because of his activism to improve working conditions at the resort. The complaint can be read here. The NLRB complaint alleges that Terranea management retaliated against him for his activism by issuing him a "final written warning" in June 2018 and then firing him in August of 2018. The company attempted to justify the termination by claiming that Lovato failed to throw away an order of chicken wings after being told to make a new batch with a different sauce. Lovato says that he followed his manager's instruction to make a new batch of wings, but since there was nothing wrong with the original wings he put them in the refrigerator for his coworkers to eat. The union charged that the company's justification was a pretext and that he was actually fired for his activism. After investigating the facts, the regional NLRB office agreed and issued the recently filed complaint. The Terranea has denied the agency's allegations that it acted unlawfully. The complaint alleges that, through its actions against Lovato, the Terranea "has been interfering with, restraining, and coercing employees in the exercise of the rights guaranteed by [federal labor law]" and "discriminating in regard to the hire or tenure or terms or conditions of employment of its employees" and thereby discouraging union membership in violation of federal law. Absent settlement, the company will be forced to appear in a hearing before an administrative law judge of the NLRB.. The hearing was initially set for March 12, but the employer requested a postponement until a date in early April. The recent complaint is only the latest of a string of unfair labor practice charges filed by UNITE HERE Local 11 against the Terranea. In May 2018, Terranea management settled five separate cases with the NLRB involving allegations that Terranea has violated workers’ rights to organize under federal law. As part of the settlement, Terranea was required to post notices at the workplace notifying employees that in the future Terranea managers would not "do anything to prevent workers" from exercising their right to form, join, or assist a union. The company also promised through the notices that that it would not engage in various forms of unlawful conduct alleged in the underlying charges, including interrogating workers about their union support, prohibiting workers from engaging in protected activity during breaks, threatening to call or actually calling the police to prevent workers from lawfully distributing union literature, or changing employees' work schedules based on whether they support the union or not. The NLRB does not impose punitive fines or damages, and such notice-postings are the standard remedy under federal law for the kinds of violations alleged by the government in the earlier five cases against Terranea. Still, Terranea refused to admit that it did anything wrong under the law. Only weeks after agreeing to this settlement, Terranea management issued Freddy Lovato the final written warning and subsequently terminated him, leading to the NLRB's recently filed complaint against the company.